Since Blue Bunny has taken the time to put out some original novelty items this summer, I knew that it was time to give their regular ice cream another chance. As I walked down the freezer aisle every week, I would think to myself "hmmm, maybe this is the week I'll make the plunge". Well, this week was the week - my eye had been caught by those two little magic words: LIMITED EDITION. Behold! 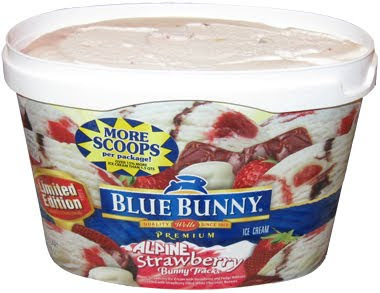 Blue Bunny Limited Edition Premium Ice Cream: ALPINE Strawberry Bunny Tracks. Strawberry flavors rarely catch my eye, but Alpine Strawberry? What is this? Sounds intriguing, especially when you read the whole thing: Alpine Strawberry Ice Cream with Strawberry and Fudge Ribbons Loaded with Strawberry Filled White Chocolate Bunnies. Oh yeah, that definitely has my attention. With so much effort put into a strawberry flavor, how could I possibly pass it by? Hmmm, doesn't look exactly like I suspected. The "ribbons" are more fragments than anything ...and why is the strawberry ice cream white? Now, Blue Bunny only has 5 limited editions flavors listed on their website at the moment, and for some reason, the Alpine description doesn't match the container: Strawberry flavored white ice cream with strawberry and fudge revels with strawberry filled white chocolate bunnies. What's a revel? must be a ribbon fragment, plus we have mention of "white ice cream". I don't think I've ever seen ice cream labeled like that before (not the same as something like Blue Moon or Purple Cow). I'll admit I was confused, but I was still determined to have a good experience. I did a quick check for any strawberry aromas (nothing obvious) and then dug in. Wow ...it's really mild, like super mild, I'm shocked. It's not bad, but it's more like strawberry whip cream than your typical scoop of strawberry ice cream. The "revels" are mild as well, there just isn't enough of them to make a huge impact. The whole thing reminds me of mixing up the bottom of a container of neopolitan when there's way more vanilla than anything else left. The bunny tracks are made by these somewhat tasty little white chocolate bunnies that are filled with strawberry. Not awesome, but not bad either. The bad news was that I only found 3 bunnies in my entire bowl!! I'll admit I was disappointed, but I always am when there aren't enough mix-ins. Overall, I'll say I like it. It's a very creamy ice cream, though I'm not sure of it's exact placement in my world of frozen opinions. It's smooth, but I wonder if it's in a strange way? Iunno, it's going to take a second bowl to be sure. I'm also not sure how I feel about how mild it is either, I mean, it's REALLY mild, by far the most mild strawberry I've ever tasted. There's nothing wrong with being different, but it helps if the flavor is strong enough to make a lasting impression. How about this: It's good enough that I'm waiting for my second scoop tomorrow. On Second Scoop: I think I like it, well, let's say I don't hate it. Actually, here is a better way to say it: It's not bad, I just don't see myself buying it again. 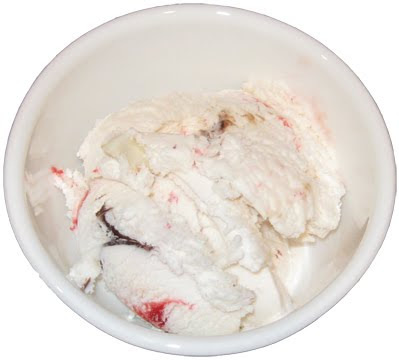 I was thrown off by a buttery taste and texture the first time I had Blue Bunny ice cream. It's a year later and I like to think my taste buds are more mature now, and I do appreciate this ice cream more than I would have before, but overall it's just boring with a texture that will take some getting use to. Also, during my second scoop I had a whopping *4* bunnies. Let's start a petition right now - if a container says LOADED, it means there should be a bunny in every scoop, not every 3rd - 4th - 5th scoop. Side Note: Blue Bunny gives you "MORE SCOOPS per package!" by running with a 1.75 Quart container. I don't know if they ever went down to 1.5, I haven't been keeping score. Oh yeah, the all plastic container has a nice tamper evident lid on it as well. It's a little touch, but it is appreciated. i will buy any ice cream that has ribbons or little bunnies/animals made out of...well anything i guess. you might consider trying BB Pistachio ice cream (one of their best) or my favorite of BB Premium Ice Cream line, Peanut Butter Panic. Many alpine strawberries are white so that could explain the color. ALthough, some alpine varieties are red in color. But, I would be supprised if they really used alpines at all for such a low end brand. oh, interesting, I guess I should have looked that up beforehand (I just did now though). and technically, blue bunny is what I call a "main stream brand", but your point could still be valid. This isn't some $5 a pint, super premium ice cream. I just tried checking their website and alpine strawberry is no longer listed, so I can't check the ingredients.